Magnus Bane witnesses his favourite 1920s hotspot fade into decay as the decades pass … and the vampires take over. One of ten eBook short stories in The Bane Chronicles, a series about the enigmatic warlock from The Mortal Instruments and The Infernal Devices. Also don’t miss The Mortal Instruments: City of Bones, in cinemas August 2013! The immortal Magnus Bane is making the most of his time in the Roaring Twenties: He’s settled into New York society and is thriving among the fashionable jazz set. And there is nowhere better to see and be seen than the glamorous Hotel Dumont, a glittering new addition to the Manhattan landscape. 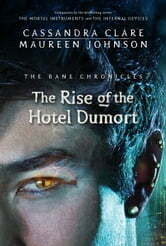 But nothing lasts forever… Fifty years later, the hotel is decayed and ruined, as dead as a place can be. But the vampires don’t seem to mind. One of ten eBook short stories in The Bane Chronicles, a series about the enigmatic warlock and fan favourite Magnus Bane from Cassandra Clare’s internationally bestselling series The Infernal Devices and The Mortal Instruments. Also don’t miss The Mortal Instruments: City of Bones, in cinemas August 2013! Follow /TheMortalInstrumentsUK on facebook or @InstrumentsUK on twitter for movie news.